Additional features include real-time, online ID verification (RealMe, NZ passport or NZ drivers licence), and options for witnessing documents. Digital signing offers a fast and secure signing option, anywhere at any time. *The digital signing process is managed by a third party digital signature service provider, and their terms and conditions also apply to this service. 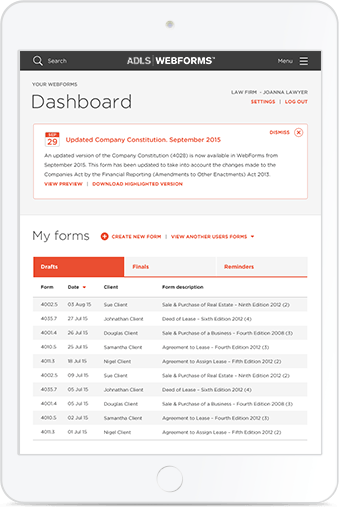 The WebForms system provides an intuitive, web-based legal document creation service, using the ADLS forms & precedents - New Zealand's most trusted legal forms & precedents. 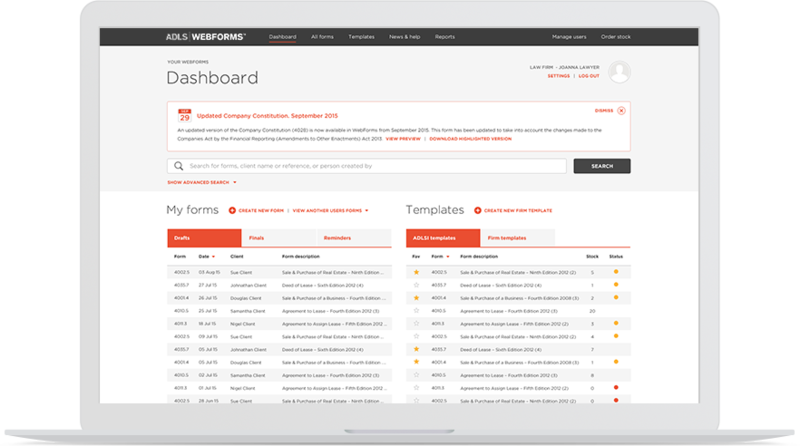 With a variety of new features, simplified workflows, and a commitment to continuous improvement, ADLS's WebForms system provides greater efficiency for busy professionals. Email us if you'd like to subscribe to ADLS WebForms, or ask a question. Alternatively call 09 303 5283 to speak to our Customer Service representative.